Are you wondering how to connect with the younger generation on social media? Could your business benefit from connecting to the 80% of online teens using social media? In this article I explore how Sharpie has successfully garnered 89% market share with the aid of social media. Instagram is now the most popular photo-sharing site among teens age 12-17. One million of them visited the site last July alone. Add to that the 93% of social media–using teens who have a Facebook account (according to Pew Internet research), and the 16% who use Twitter (a figure that has doubled in recent years), and you’ve got a lot of teenage eyeballs. But to connect with a teen target market, you must do more than simply have a presence on the sites they use. 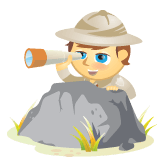 You must also pay attention to what motivates and inspires them. Take some tips from permanent marker manufacturer Sharpie. Their successful 2012 Back to School campaign helped grow their market share to 89% of their category through a savvy understanding of how teens use social media. “Teen behavior shifts so quickly; their biggest enemies in the social space are boredom and unoriginality,” said Susan Wassel, director of social media and PR at Sharpie parent company Newell Rubbermaid. Sharpie has an advantage as an inherently visual brand. But they still constantly look at their content with a critical eye to ensure it appeals to teens. 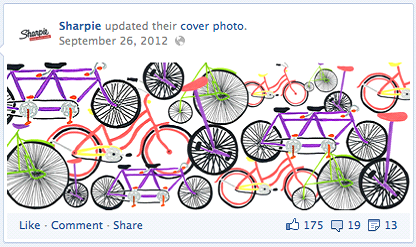 Sharpie's hand-drawn cover photos are updated frequently. They make sure to change their Facebook cover photo frequently with striking Sharpie-drawn designs to catch their teenage fans’ eyes. 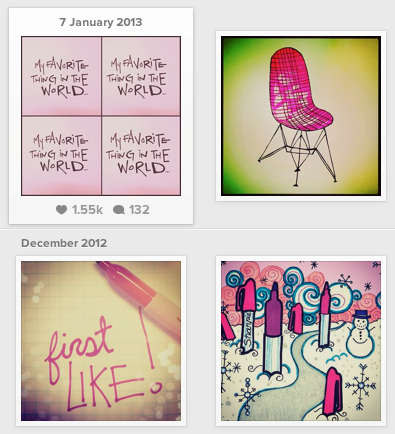 Sharpie’s newest social media channel, Instagram, showcases drawings and product shots generated in-house. Whitney Kelly, PR and social media associate manager in charge of Instagram for Sharpie, has been surprised by the number of followers. Sharpie's Instagram photos range from intricate drawings to simple text. Video is also a big part of Sharpie’s social media. “Video content is highly engaging for our teen target,” said Ryan Rouse, global director of marketing Sharpie at Newell Rubbermaid. “The stars of that video are our fans and their creations that they’ve submitted to facebook.com/sharpie and our .com site during the back-to-school period,” said Rouse. Sharpie conducted a study with both teenagers and adults several years ago to learn how they were using the product. They discovered “an overwhelming amount of creative and expressive usages coming from teens,” Rouse said. The Sharpie marketing team moved toward promoting more self-expression with the product and giving users ways to share what they had created. The YouTube channel, for example, features a Get Inspired playlist showcasing artists using Sharpies making unique creations on skateboards, coffee cups, subway maps and discarded window frames. Even fans whose artwork did not end up in the official music video could create a custom music video mashup and share the results via Facebook, Twitter or a permalink. Sharpie encouraged fans to create their own music video mashup after the MTV VMAs. 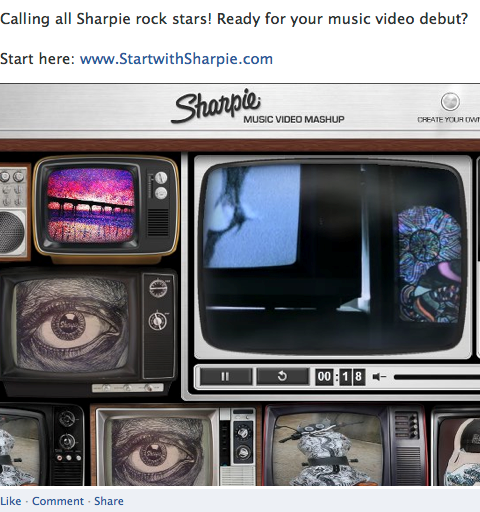 Although a TV ad is traditional marketing, Sharpie integrated the spot with their social platforms. They chose the MTV VMAs to take advantage of the emerging trend of social TV among teens. “We’re seeing broadcast television interaction with social networks being a growing trend,” said Rouse. 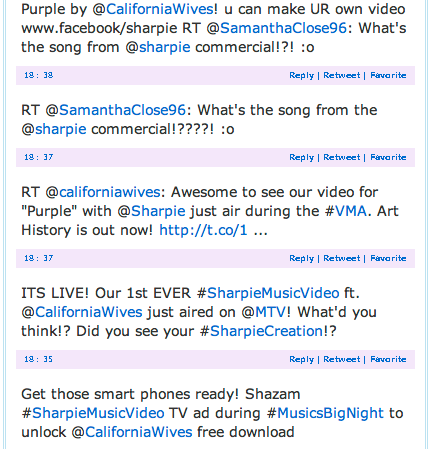 Sharpie collaborated with BOP and Tiger Beat magazines to co-host a VMA Twitter party during the red carpet pre-show. And the ad was Shazam-enabled, taking fans to a custom landing page where they could view the full version of the video and access one of 5,000 free downloads of the song. Sharpie engages with fans who tweeted during the MTV VMAs. Not every company can hire a nationally known band, shoot a music video and air the ad on MTV. But many of Sharpie’s tactics can be scaled to a teen-targeted business of any size. Instagram is a good place to start. Rouse calls it a perfect storm of self-expression, both visual and mobile. “It looks and feels like what our audience is doing every single day,” he said. And don’t forget to communicate with your teen fans. Kelly even spends after-hours time searching for photos tagged with #Sharpie to comment on them, and responding to comments on Sharpie’s own photos. “I know that when a brand responds to me on social media I’m excited, so I try to give our fans that same pleasure and excitement and gratification,” she said. Sharpie responds to fans' comments on Instagram. What do you think? Does your company target teens on social media? What works and what doesn’t work? How can you scale Sharpie’s tactics to fit your company? Leave your questions and comments in the box below.